250 total news articles in this section, 10 per page. Today we have good news for fans of the Transformers Kiss Players line. The full sized 1:24 Scale version of Autorooper has been released in Japan. To see new images of Autorooper click here. There have been new Star Wars Transformers sightings in Canada. Megatroptimus of Cybertron.ca has reported finding Star Wars Transformers Darth Vader (Star Fighter) and Clone Pilot (ARC-170 Tiger Shark). Both figures were found at a Toys "R" Us in Quebec. Well it looks like Transformers Classic Legends Wave 1 has finally been released in the United States. Gunman_sr5 of TFW2005 has reported finding the figures at a Meijers Champaigne, IL. That's not all; Transformers Classic Legends Wave 1 is also out in Canada. CrackerBoy of Cybertron.ca has reported finding Leo Prime, Perceptor, Trypticon, and Fireflight at a Toys "R" Us in Ontario. Transformers Classic Legends Wave 1 has also been released in Australia. Finback of Allspark.com has reported finding wave one at a Toyworld in Western Australia. Classics Jetfire released in Australia! 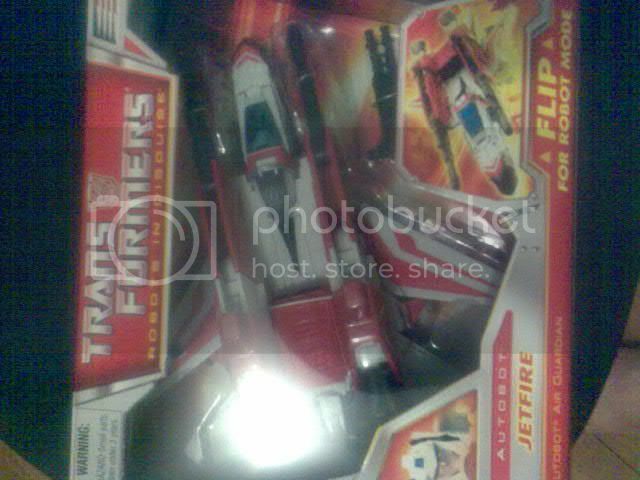 With just a few days to go before Christmas, Jetfire has finally appeared in Australia! Seibertronain kazhunter reported finding him at a Target store in Sydney, along with Grimlock and Mirage! You can view proof of purchase pictures here and here. I can tell you there are some improvements made to this figure since the photos we've seen. Firstly there is a SILVER faceplate, not gold. Looks great, though there are no paint apps on the eyes, and the photos on the box show both the gold faceplate and blue eyes. Secondly, the infamous CODPIECE has beeen toned down too, by having been squared and with grilling for detail. When you are that big, it needs some air, aye? It's still an issue, as it gives this figure a long torso and short legs. Legs are awkward all round, really hurting the look of the robot mode. Poseability is still very limited, but arms and general detail is very nice. All in all a touch more show accurate than G1 release, but a lesser toy as will be evidenced by the upcoming reissue. Much more plastic than die cast. Worth getting if you're a Soundwave/G1 fan. No positive sightings of Rodimus Prime yet but him and Soundwave are packaged together as part of the same wave so Keep you eyes peeled! Be sure to post your sightings at the SEIBERTRON.com Sighting Section. The next place new figures have been found is Italy. Both Transformers Cybertron Yellow Scrapmetal and Brakedown GTS have been found in Italy. Finally new Transformers Cybertron figures have been released in Belguim. Galaxy Force Vector Prime and Quickmix have been sighted. Transformers Classics Reissue Soundwave Released In China? A new image of the upcoming Toys "R" Us Exclusive Transformers Classics Reissue Soundwave has surfaced at Visualmedia.com. The image was taken at a store in China. There is no mention as to which store the picture was taken at. Vector Prime have been released in The Netherlands. The figures are priced at €20. There have been some new Transformers sightings in Europe. The first report comes from Germany and is somewhat of a surprise. Transformers Cybertron Metroplex has been released in Germany. This is a little surprising because Germany does not always get some of the bigger Transformers releases. The next sighting report come from Poland. Wartator of the Trans-Europe-Express Group has reported that Transformers Cybertron Micromasters Superion is out in Poland. More new Transformers sightings from around Europe have been reported! We have some news of new figures being sighted in Canada. It now appears that the first wave of Transformers Classics Mini-cons are hitting store shelves in Canada. The first wave includes the Dinobots (Terrorsaur, Knockdown, and Swoop), Night Rescue Team (Strongarm, Divebomb, and Firebot) and Demolition Team (Wideload, Sledge, and Broadside). Both Paradigm-Shift Prime and CrackerBoy of Cybertron.ca have reported finding the figures at a Toys "R" Us in Ontario. So keep your eyes opened!